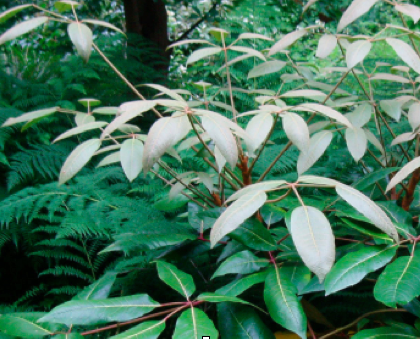 Big bold evergreen shrub that deserves a place in every garden. Tall growing cold hardy shrub with leaves that can be up to 18″ across- all three leaflets. New growth in spring emerges slowly clad in a showy taupe indumentum that clings to the new leaves for quite some time. The ultimate leaf color is deep green with a matte surface. To 12′ tall and branching. Moderately fast growth in rich soil that is well drained with consistent summer moisture- to speed growth. Otherwise established plants are remarkably drought adapted in part shade to shade. Takes full sun but leaves are smaller and the plant grows more slowly. An open north exposure is ideal with cool roots and the tops in the bright sun but not reflected heat. In autumn 3′ long pale yellow flower spikes appear and persist until frost. Excellent, refined shrub that has been perfectly hardy to cold for us for the past decade.